Plans for a couple of key pieces in Erie's bayfront renaissance puzzle cleared another hurdle with surprisingly little comment from the community. And one of the people involved in the design of the Erie County Convention Center Authority's new project isn't sure what to make of the smooth public sailing. 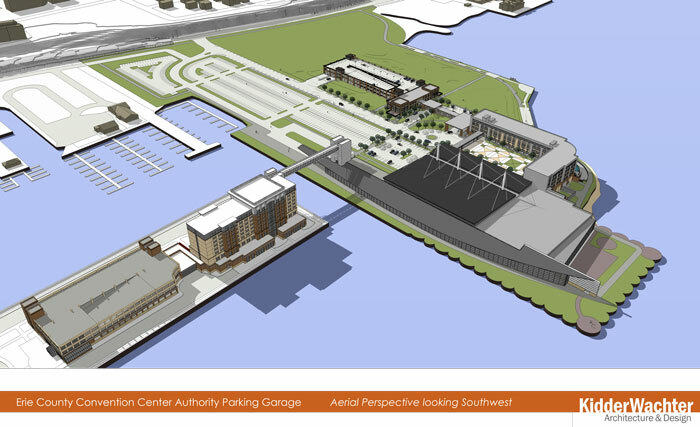 The city of Erie Planning Commission on June 17 recommended approval of two projects – a proposed 191-room Courtyard by Marriott hotel and three-story parking garage and adjacent 8,000-square-feet of commercial space just west of the Bayfront Convention Center and near the former GAF roofing shingle plant site. That marked the second public meeting held last month on the project; the city's Design Review Committee also recommended approval on June 4. On April 8, the Erie Zoning Hearing Board signed off on the hotel project, granting a variance that would allow it to rise to a height of 61 feet – 11 feet higher than the standard limit of 50 feet. Now that the Planning Commission has recommended approval, the project will proceed to the City Council, where a hearing has tentatively been scheduled for Aug. 6 at the Bagnoni Council Chambers. The council must approve before any building permits could be issued, said Matthew Puz, a city zoning officer. At June's Planning Commission meeting, no major opposition was voiced. 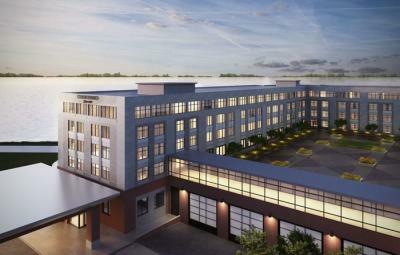 Kidder Wachter, a local architectual and design firm, is designing the parking garage and commercial space and also has developed a master plan for the area while the Denver firm of Sink Combs Dethlefs, which did the design work for the renovation of Erie Insurance Arena, is designing the hotel. 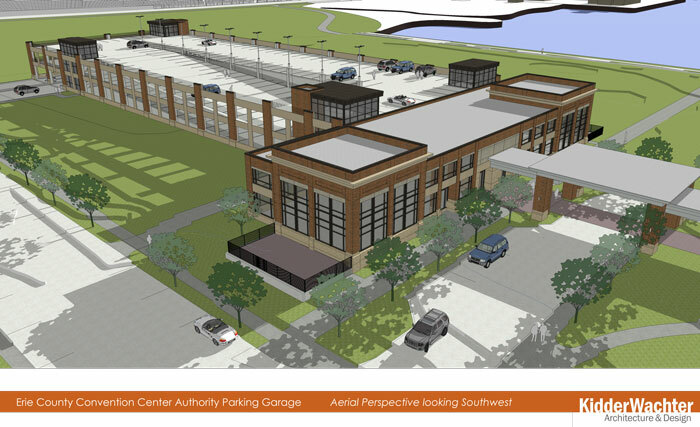 Chip Wachter, a project architect and partner at Kidder Wachter, noted that the new hotel/parking garage/commercial space projects had been the subject of four previous public meetings and no major objections have been voiced to date. "The concept plan – developed by Environmental Planning & Design, LLC – has been public for two years," Wachter said. "And the Kidder Wachter and Sink combs Dethlefs proposal for two building has been presented at public meetings since March." Wachter said the people that he's heard from seem to think the project is "a great idea. All of the feedback we've been receiving is very favorable." That's not exactly the case on social media, though. One Facebook page had comments from more than three dozen people and a number of them questioned the need for a second hotel. The area already is home to the Sheraton Bayfront Hotel, which opened in 2008. Some also have questioned the financing for the new hotel; a $25 million state grant will go a long way toward making the project materialize, and Erie County has agreed to back up to $60 million in bonds. At the Planning Commission meeting only one member of the public voiced concerns about the project, according to the meeting minutes. Those concerns focused on such issues as parking, sidewal sizes and stormwater plans. Wachter said he welcomes more questions from the public about the proposed Convention Center Authority project and added that he's "more than happy" to talk to anyone seeking more information. "It's natural that people have questions and have their own ideas of what should be going on down there," he said of the bayfront. "AJ Schwartz [of Environmental Planning & Design] solicited opinions back in 2012. It's been in the public realm for a couple of years. If people wanted to propose putting something down there, they've already made those proposals and they were properly vetted." Wachter said one reason why the community might not have objected to the proposed project at recent meetings is because in terms of building design, "we're not proposing anything exotic. 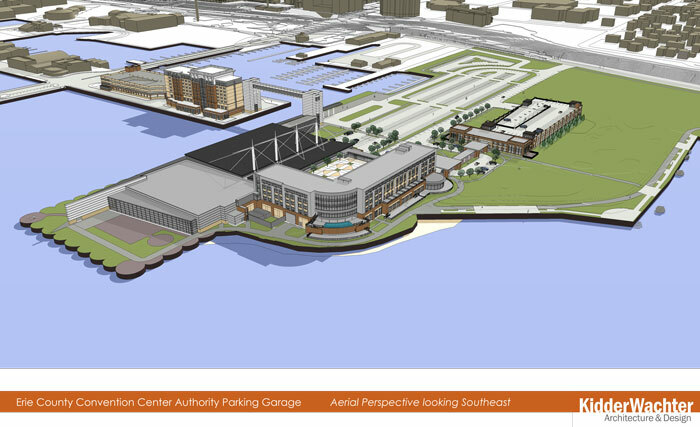 But in terms of projects for Erie's waterfront, it's a big one – and it's a very exciting one." Wachter said one key aspect of the project is that the design is flexible to accommodate future growth if needed. For example, he said the parking garage is designed so that an additional two levels could be added down the road. The same could occur with the commercial space, as additional levels could be stacked on top. "We're not just designing for the next two years but for the next 25 years," he said. "The important thing is that we're implementing aspects to make sure we're not doing things we wish we hadn't done down the road." The 8,000-square-feet of commercial space has no tenants yet, but Wachter said one logical use would be for a restaurant or two. And as the area becomes more of a neighborhood, he said, it could easily house various retail outlets. But that remains to be seen. "The market will dictate what it wants to be," he said. "We're not trying to be dictators about this. We're just trying to set the table and let the Erie market dictate what it wants to be." Frank Garland can be contacted at fGarland@ErieReader.com.